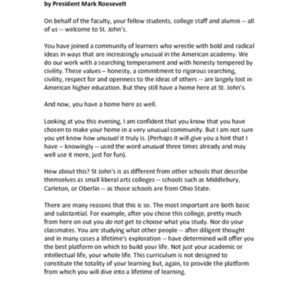 Creator is exactly "Roosevelt, Mark"
Transcript of the convocation address given on January 14, 2019 by Mark Roosevelt in Santa Fe, NM. Transcript of the convocation address given on August 23, 2018 by Mark Roosevelt in Santa Fe, NM. Transcript of the convocation address given on August 24, 2017 by Mark Roosevelt in Santa Fe, NM. Audio recording of a phonecast conversation on November 29, 2016 with President Mark Roosevelt, Phelosha Collaros, and alumni. 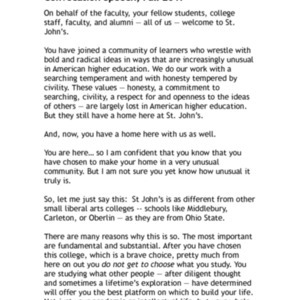 Audio recording of a phonecast conversation on May 12, 2016 with President Mark Roosevelt, Phelosha Collaros, and alumni. Transcript of the convocation address given on August 25, 2016 by Mark Roosevelt in Santa Fe, NM. 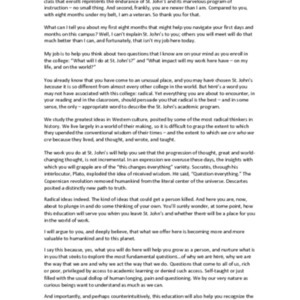 Transcript of the convocation address given on January 18, 2016 by Mark Roosevelt in Santa Fe, NM. Transcript of the convocation address given on January 16, 2017 by Mark Roosevelt in Santa Fe, NM. Typescript of the inauguration speech given by Mark Roosevelt on September 16, 2016 in Santa Fe, NM.